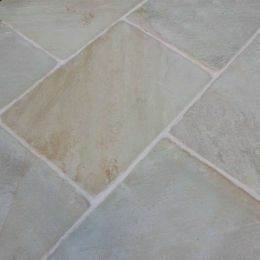 Minster Beige Antique Flagstones offer a lightly coloured tile with shades of rust and grey running throughout. This range offers a tumbled and gently brushed surface and has hand-dressed edges. Tiles are 20mm thick and are suited for both indoors and external applications. We carry a great range of consumables, from adhesives, grout, bonding agents and sealants to maintenance products to keep natural stone tiles beautiful for years.